Life’s going down the gurgler for romance writer Lisa Trumperton. The deadline for her next novel is looming, her daughter won’t eat but has a new tattoo each week, and now her Wall Street trader husband has run off with a woman at work. Lisa makes a quick escape, home to Australia, where at least her girl-magnet son seems to be making hay. Determined to grow older disgracefully, she turns her back on a trim and tidy townhouse that is close to shops, aged-care providers and her bossy older sister, instead buying a grand old house in the country that once belonged to her great-grandfather. Richly observed and laugh-out-loud funny, Tumbledown Manor is for anyone who believes it’s never too late for a makeover. 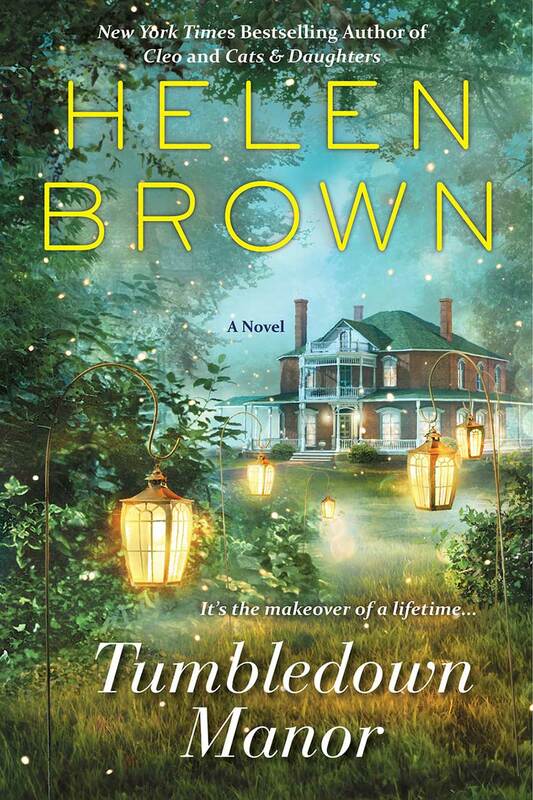 What happens when you pick up Helen Brown’s new novel, Tumbledown Manor? In my case you grab it and head for a comfy spot where you can relax and enjoy a few hours of delightful reading – preferably with a feline companion. Belle Amie, my fluffy white calico, and I settled onto the bed with great anticipation. Before long we were grinning and nodding (me) and purring (her) as we cuddled in the glow of Helen’s storytelling skills and wit. Full disclosure: I admit this wasn’t my first time reading the book. I am, after all, Helen’s American editor, so I was privileged to be among the first to read her novel as a manuscript. I rarely have time to read a finished copy of a book I’ve worked on. But I knew Tumbledown Manor would be the exception – a book I loved so much, I just had to experience it afresh in its enticing printed form. Guess what – it was just as good as I remembered it! Helen’s engaging voice brings to life an irresistible story of a woman bravely setting out to renovate an old family home – and her life. Give it a try, won’t you? The feline companion is optional, but highly recommended. Just settle in and enjoy. Through all of the challenges Lisa faces, she continues to find the positives in her life, and readers will be inspired to see her grow. 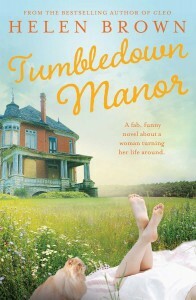 Tumbledown Manor is a fun read that will leave readers with a warm glow. Addressing all-too-common mid-life catastrophes, Brown gives inspiration to women with her witty, adventurous story. Her delightful account of one woman’s struggles after divorce and relocation around the world will bring laughter and warmth to her readers. Brown has a unique ability to bring life to her characters, painting a picture with her words. Brown, author of best-selling memoirs Cleo and Cats and Daughters, writes with empathy and humor in her first novel, about finding new love and purpose in middle age. “I read it fast. I laughed aloud a couple of times (which happens a lot in real life but rarely when I am reading). Ausgerechnet am fünfzigsten Geburtstag von Lisa Katz stellt sich durch eine falsche Blumenlieferung heraus, dass Lisas Ehemann eine Geliebte hat. Lisa entschließt sich, New York hinter sich zu lassen und nach Australien zurückzukehren. Dort erwirbt sie das Anwesen ihrer Vorfahren: Trumperton Manor. Als es schon beim ersten Unwetter durch die Decke regnet, kommt ihr Scott, der Gärtner, zu Hilfe. Und obwohl Lisa das Kapitel Männer für beendet hält, gelingt es ihr nicht, seinem Charme zu widerstehen. Helen Brown ist eine großartige Erzählerin, die zu vermitteln weiß, dass private Katastrophen der Weg zum Glück sein können – mit dem einen oder anderen Umweg.